Today Vermeer is considered to be one of the great Dutch master painters even though it has never been proven that he sold even one of his paintings. The lack of wealth and fame that he gained from his work it not important, though. 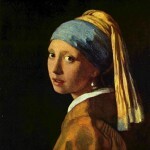 What makes Vermeer great is his use of techniques called pointillé and camera obscura. Pointillé is the creation of transparent colors by adding the paint onto the canvas in loosely granular layers. Camera obscura is what Vermeer probably used to create the sparkling pearly highlights you may have noticed in his paintings. Camera obscura is a primitive lens that would produce halation and exaggerated perspective. 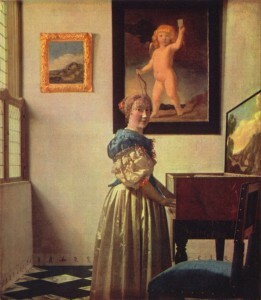 The effect can be seen in Vermeer’s "Lady at the Virginals with a Gentleman" (London, Royal Collection).